Available to purchase on this page are items from the collection of former Welsh International player and Ospreys coach Lyn Jones. 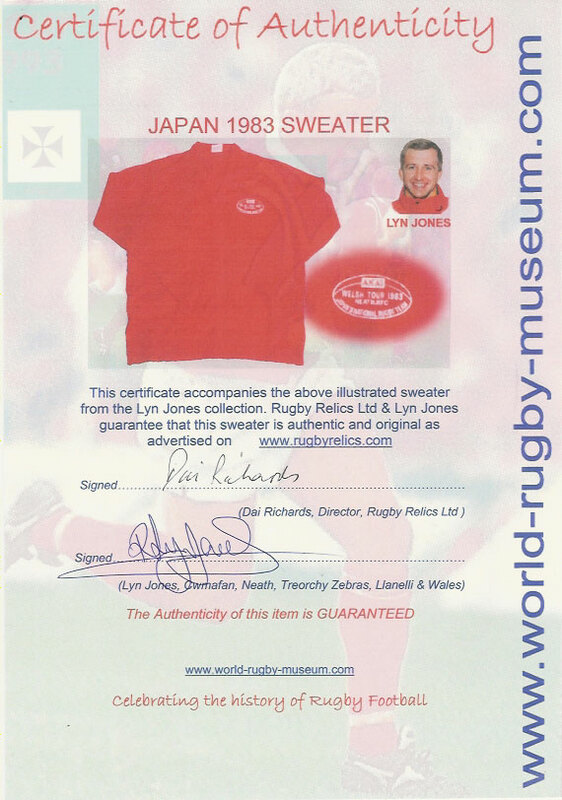 Each item is accompanied by a Certificate of Authenticity signed by Lyn Jones. Please scroll down or click on the links below to view the collection. 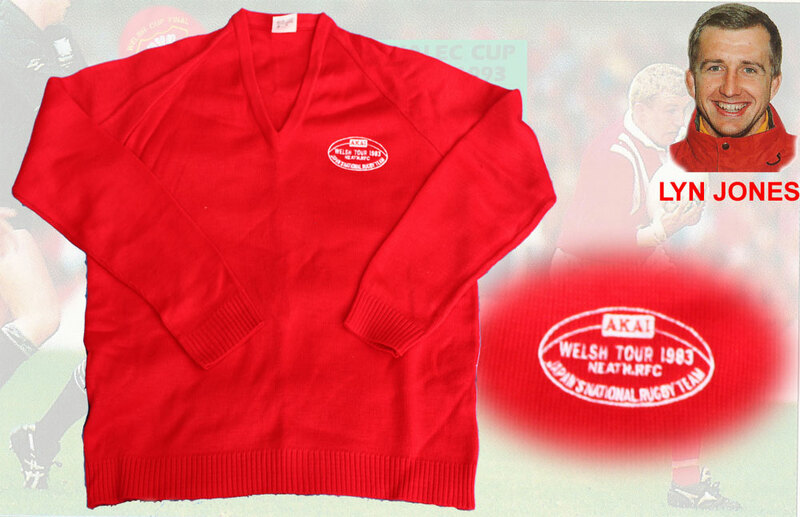 Japan National Team tour of Wales 1983 v Neath sweater. Size extra large, manufactured in Scotland, 100% acrylic fibre, this is possibly a Japan team issue sweater although Lyn is not sure of it's origin. Lyn could have been an Aberavon Wizards star following in the footsteps of his late father Peter and brother Ashley both of whom were open side flankers with a thirst for flattening outside halves. Lyn used to love playing against Mark Ring, no doubt with the same aim in mind. However Jones’ early career coincided with a severe economic downturn in the steel town of Port Talbot and a poorly administered Wizards and found himself drawn to the rising cross of arch rivals Neath at the dawn of their triumphant 80's revival. That Cwmafan resident Jones would join the enemy says something about his single mindedness to become a top rugby player rather than follow the well-worn path of local boy, local club, and loyal forever. What perhaps was also taken as typical Jones cheekiness was his claim that his ambition was "to coach a successful Lions side in South Africa ", in hindsight this was a serious remark. Likewise was the other ambition, despite being single at the time, of "being a good husband and father one day". Lyn's playing career took on a new level when he joined the successful Llanelli Scarlets team of the early 90's. On November 14, 1992 Jones played his heart out swarming over Aussie outside half Tim Horan in a dramatic 13-9 win over world champions Australia at a heaving, electrified Stradey Park. Ieuan Evans scoring the winning try. This perhaps was the pinnacle of Jones’ playing career. His time at Stradey Park culminated in the treble that season where he and outside half Colin Stephens shared the honour of most appearances. That was an indication of the toughness and durability of Jones who by now despite 'shrinking an inch' had attracted the attention of the Welsh selectors who called him up for 5 caps in 1993. Ospreys, Neath-Swansea - replica child's size early Osprey's jersey from by Kooga, possibly a team mascot's jersey, un-numbered size approx age 10-12, the jersey has been worn and is a little grubby. This jersey comes complete with a COA signed by Lyn Jones guaranteeing it's authenticity. 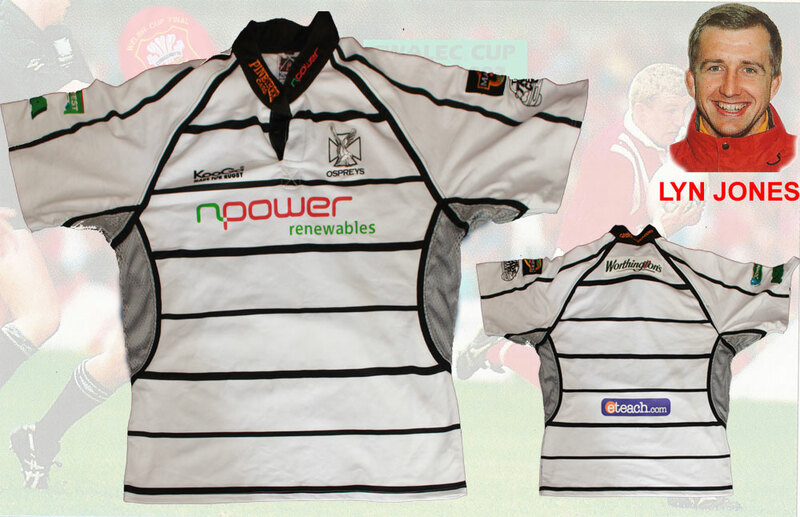 Ospreys 2006-07 season - team issue alternate strip jersey by Kooga, un-numbered, size XXXL, in excellent condition. This jersey comes complete with a COA signed by Lyn Jones guaranteeing it's authenticity. 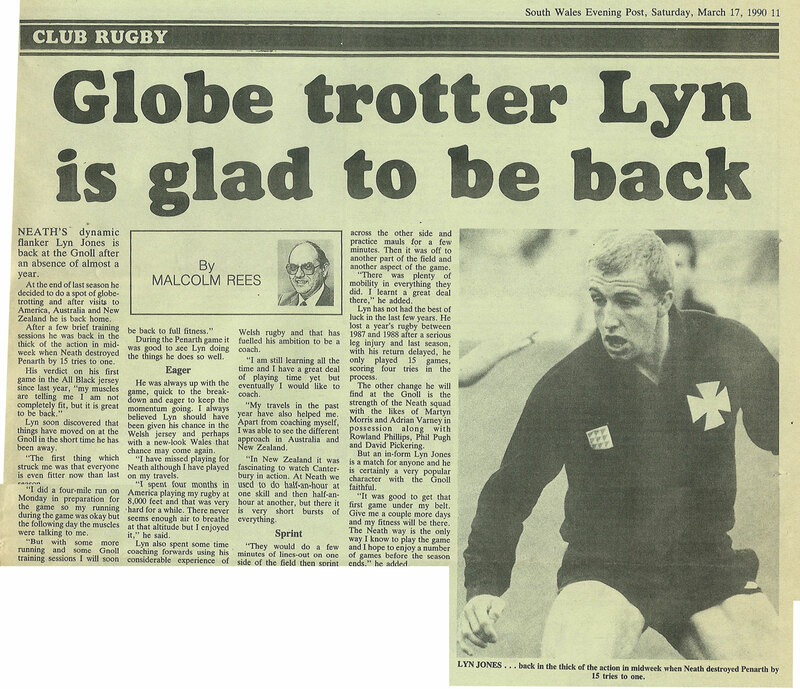 Returning to Neath was always an ambition of Lyn's and when the offer to coach the Gnoll club came he grabbed it with delight and took the 'Men in Black' to the 1994-5 Heineken National League title. That summer the game turned professional and Jones was on the move again for a short spell at the ambitious Treorchy club as a player/coach before returning once more to the Gnoll. It was during this second spell at the helm that he forged himself as a pro active innovative coach with a great eye for unrecognised talent. Take one Shane Williams for example whom Jones signed up as an unsuccessful district scrum half and helped turn winger Shane into World player of the year a decade later. Throughout his playing and coaching career thus far, Jones had also managed to work as a boilermaker, started his own "open all hours" hardware store, set up a successful industrial supplies business, and become a good husband and father of two boys. Then the revolution in Welsh rugby came. Neath joined forces with Swansea and the Ospreys were formed with Jones as coach. Jones' straightforwardness, ability as a man manager and group leader saw the Ospreys become a young team with potential. An eye for a bargain and his opportunistic nature then saw Jones snap up Ryan Jones, Brett Cockbain and Sonny Parker from the disbanded Celtic Warriors. From this point the Ospreys kicked on to win trophies and become a serious player in the Heineken cup. Along the way an almost second string Ospreys side were lead to victory over the touring Wallabies in a 24 –16 thriller, to give Jones the honour of defeating Australia as a player and a coach. However no sooner had Jones' Ospreys built on this success with a stunning win over Leicester at Twickenham in the Anglo Welsh cup final, the media turned on them. Was it payback for Jones' "chequebook Charlie's" quip aimed at Cardiff a decade earlier? Was it the maverick nature of his media dealings with the trademark grin, raised eyebrows and even a poke of the tongue to accompany a witty and sometimes withering remark? The Ospreys supporters lovingly called him "Lyn the Grin." Whatever the reason the media daubed the unwanted "galacticos" tag due to the number of Welsh internationals, on the Ospreys and it stuck. The implication was that with all that talent they should be best in Europe . 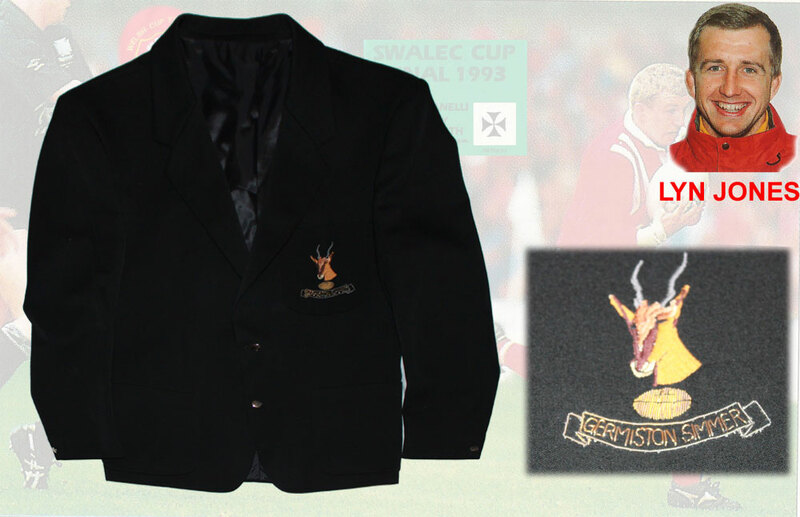 Germiston Simmer RFC blazer by Personality, pure wool, size approx 46" (XL), badge including Springboks head embroidered to blazer, in excellent condition. This blazer comes complete with a COA signed by Lyn Jones guaranteeing it's authenticity. 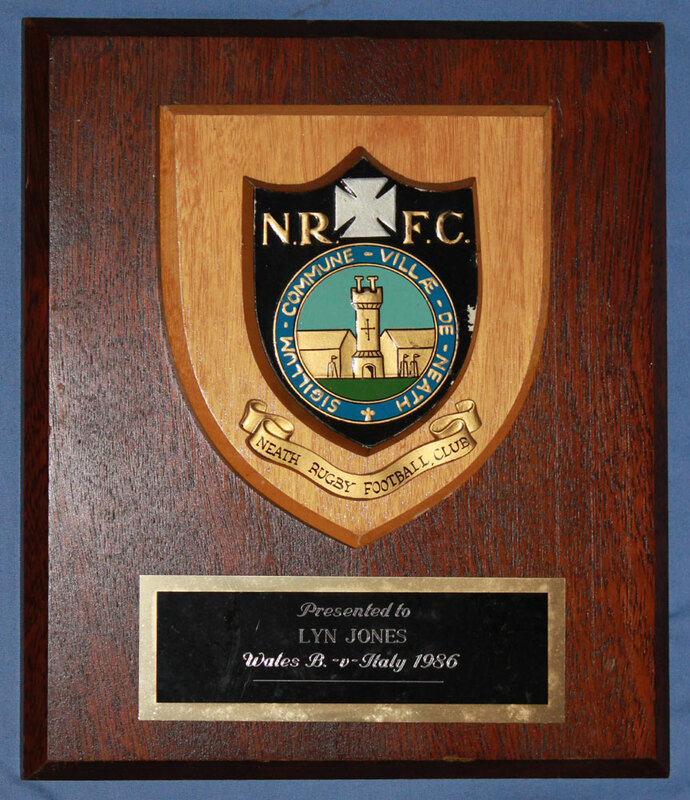 Presentation plaque from Neath RFC to Lyn Jones on his representation for Wales B against Italy in 1986, size 28cm x 15cm, in excellent condition. This plaque comes complete with a COA signed by Lyn Jones guaranteeing it's authenticity. 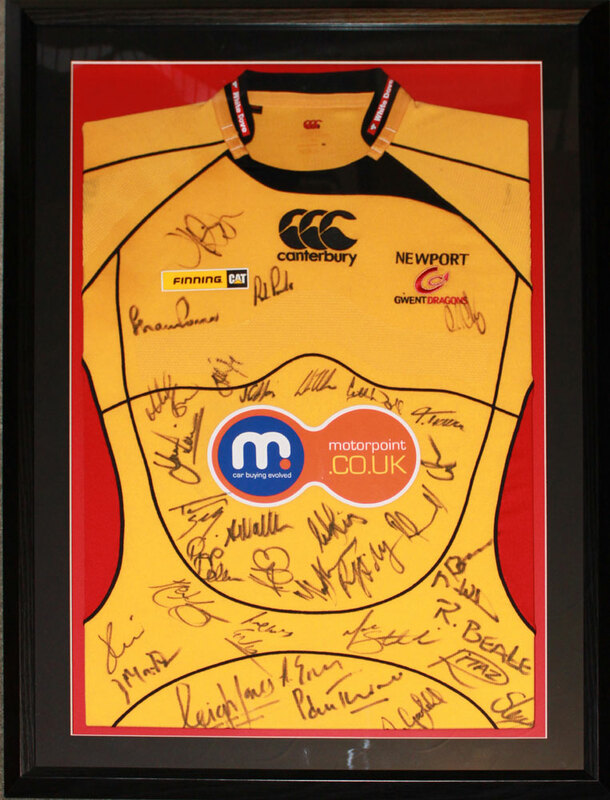 Dragons 2009 signed jersey framed. This jersey was presented to Lyn after his stint with the Newport Dragons region. This jersey is signed to the back of the frame by Lyn with a personal note. The jersey is currently on display at the Halway House in Glynneath and available to purchase 'off the wall'. Not being one to sit around Jones headed off to the Dragons for a stint as attack coach before surprising the rugby world by taking up a post in Abu Dhabi as a rugby consultant at a private school. Jones is enjoying seeing the world, taking in trips to China ’s great wall, Florida and Australia amongst other places. He loves travelling with his family from his Middle East base where the Oil rich nation is on the rise. Before taking off to the middle east Jones made another important journey when, with a group of friends he cycled from Paris to Geneva in support of the Welsh Charitable Trust). Jones was moved to action after the tragic death of former Neath player Gareth Jones, who never recovered from an onfield spinal injury. A man who has coached the likes of Ryan, Duncan and Adam Jones, Shane Williams, Justin Marshall (his greatest challenge), Gavin Henson, Alun Wyn Jones and Ian Evans is too good to be lost from Welsh rugby. However Jones has always put emotion to one side when considering his future and has almost always been one step ahead. Will we see him again in a tracksuit ? We certainly hope so !!!!! UPDATE - Lyn has returned from Dubai to take up the head coach position at London Welsh. he has since guided 'the Welsh' to the top flight of English rugby, the Aviva Premiership. Bryan Cokely has spent the past 25 years sunning himself up in Australia . 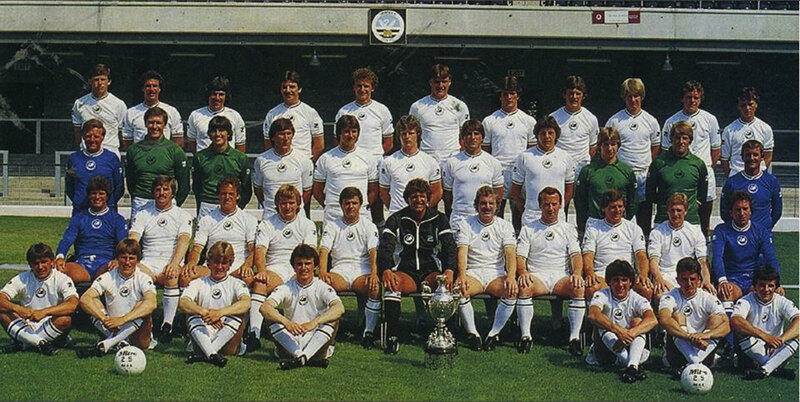 Having left school at 16 to join John Toshack's Swansea City he then left Wales at 19 to join Sydney City in the Australian National Football League. Despite Sydney winning the title that year Cokely moved on to allow himself the opportunity of University study in Wollongong . Whilst gaining a Bachelor of Applied Science degree he managed to add a New South Wales State Championship followed by a National League win the following year with the upstart Wollongong Wolves playing alongside the likes of Alan Brazil, Paul Mariner and Trevor Francis. His time in Football in Australia exposed him to many different football styles from around the world in the cultural melting pot that is Australian Soccer Football. A career ending injury at 25 meant that Cokely took up PE teaching and a decade later became a Physics teacher. He also spent a decade coaching juniors and progressed to become a staff coach at the Manchester United sponsored Parramatta Eagles Academy . Along the way Cokely took a team a team of 15 year olds to Sweden to gain a runners up spot in the famous Gothia Cup. To fill in the hours between all that he became a football correspondent and columnist for Inside Football. Now he is more likely to be seen at home with his two daughters and Australian wife Karen. In the quieter moments he will sip on a trappist ale whilst listening to a bit of Pat Metheny Wayne Shorter or Chick Corea.....Niiiice ! On being pressed for a greatest moment in sport Cokely fondly recalls his record breaking run around Mynnydd Dinas to lift the school (Glanafan) cross country title in a time which has never been beaten. 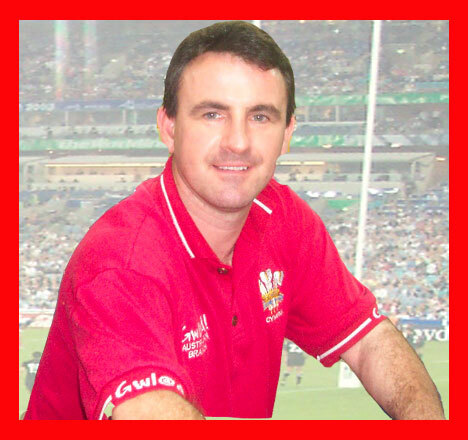 Bryan has a voracious appetite for Welsh sport and has kept in touch through any means possible, DVD 's Internet and occasional visits, the most recent being a trip to cover the IRB under 20 world cup in Wales. Lyn's profile in a 1980s Neath programme and newspaper report ! Lyn as a youngster on the field after the Wales v NZ 1978 match.